After completing an assessment of the humanitarian needs of the victims of the mudslide that occurred last weekend in the town of Mocoa, located in the south of Colombia, in the department of Putumayo, an Médecins Sans Frontières team has started to provide psychosocial support and medical care to the victims at one of the shelters that have been set up to care for the victims in the area. In the early hours of Saturday, 1 April, heavy rains caused the Mocoa, Mulato and Sancoyaco rivers to overflow, causing landslides in several parts of Mocoa. The flooding of these three rivers triggered an avalanche of mud and stones that caused the destruction of several neighbourhoods of the town. Within hours of the disaster an Médecins Sans Frontières emergency team was on its way to assess the needs. In the Las Americas shelter, which has taken in hundreds of families and people who have lost everything, Médecins Sans Frontières doctors and psychologists are conducting primary health consultations, prioritising the care of vulnerable groups, women and children. In the first two days of the intervention, the team carried out 37 medical consultations. Mental healthcare is provided in the shelter, town and surrounding areas where the victims of this natural disaster have taken refuge. Médecins Sans Frontières psychologists have begun to work with the community, conducting group psychosocial activities and providing individual consultations to help the victims cope with the loss of their loved ones and their homes, and to restore normality after the disaster that caused the destruction of more than 17 neighbourhoods in the area. 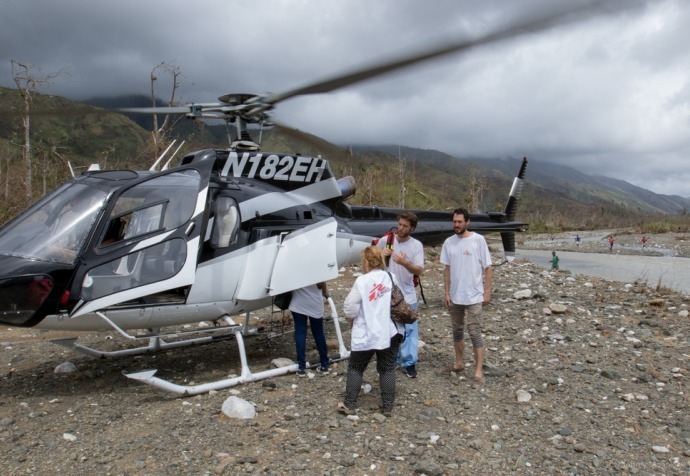 "People continue to distraught by the loss of their families and belongings, there is a persistent fear of the possibility of a new natural disaster” says Laura Garzón, one of the Médecins Sans Frontières emergency team psychologists. The number of dead and missing continues to increase. Per the latest official reports, up until this Thursday, there were more than 293 dead and 332 injured and more than 3,000 families were affected. The Médecins Sans Frontières team will continue to assess the needs of those who are not being cared for in the shelters, and monitor possible epidemic outbreaks due to the poor hygiene conditions and lack of safe drinking water, especially among vulnerable groups at risk.